Lower back pain is something that has affected everyone at some point in their life. Finding relief from lower back pain can sometimes be difficult because it can be triggered by different activities or positions. 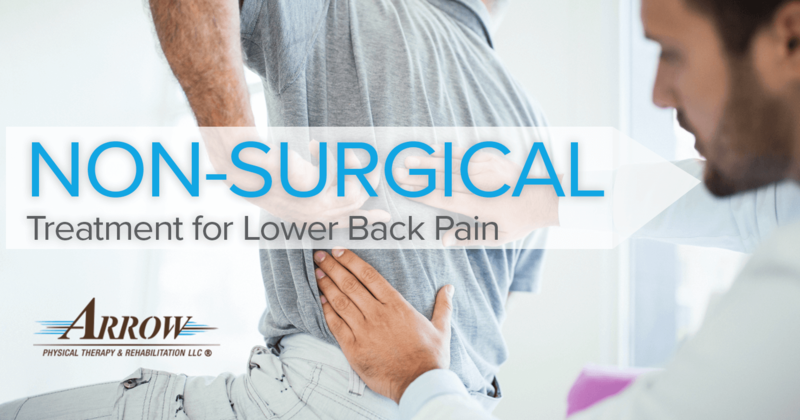 Knowing that you may be in pain no matter what you do during a day can be overwhelming, and you may feel like surgery is your only option to find lower back pain relief. However, several nonsurgical treatment options are available that may be able to help relieve your lower back pain. Take a moment to read through many common nonsurgical methods of back pain treatment, and contact our team of certified physical therapists at Arrow Physical Therapy and Rehabilitation with any questions you may have regarding the nonsurgical treatment options available to you. For many people experiencing chronic lower back pain, symptoms can be relieved after several months of personalized nonsurgical treatments. These treatments should always be recommended and monitored by a doctor to avoid injury or increased pain and symptoms. Daily Stretches – Patients with lower back pain may find some relief from exercises such as yoga, pilates, or simple at-home stretches, which help to loosen the muscles surrounding the spine that may be strained and causing nerve compression. You can find at-home stretches for lower back pain here, or you can consult one of our physical therapists for a more personalized routine. Lifestyle Changes – Changing your daily habits, such as your diet and quitting smoking may help reduce your lower back pain, especially when combined with the right amount of exercise. As above, please be cautious when attempting new exercises as they may put more strain on your lower back and increase your symptoms. Physical Therapy – Physical therapy may be very helpful for people with lower back pain because it works to decompress the pinched nerve that is causing your pain while simultaneously strengthening your core muscles to help reduce your risk of developing another pinched nerve later in life. A physical therapist may give you specific exercises or stretches that you can do in the office or at home, as well as incorporate other methods of therapy such as massage therapy and stretching to help expedite your pain relief. When doing any stretches or exercises at home, be sure to listen to your body. If you experience pain more than just the stretch of a tight muscle, stop what you are doing and rest. If the pain does not subside after several minutes, contact your doctor. There are many causes of lower back pain, and some exercises and stretches can increase your pain instead of relieve it. This is why it is always a safer option to consult a physical therapist about treatment options than to try treatments on your own. If you are in the Woodbridge, Edison or Union area of New Jersey, and you are experiencing lower back pain, contact our physical therapy office near you today to schedule an appointment. Our team of certified physical therapists at Arrow Physical Therapy and Rehabilitation can help you find relief from your lower back pain by creating personalized nonsurgical treatment plans, and then walking with you every step of the way toward pain relief. Contact us today to schedule an appointment or fill out our appointment request form online. It’s time to take the next step toward recapturing your life from chronic back pain.